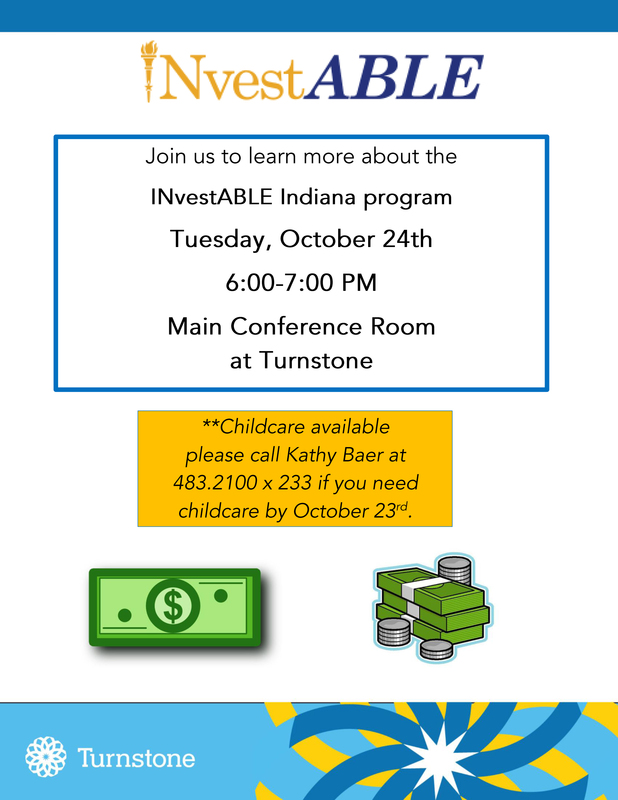 Fort Wayne, IN – Turnstone is hosting an informational session on Tuesday, October 24, 2017 at 6pm in the Plassman Athletic Center Main Conference room at Turnstone. This will allow people the opportunity to hear more about the INvestABLE Indiana savings plan and ask questions. The presentation will be put on by Amy Corbin from the Indiana ABLE Authority. Before the new INvestABLE Indiana savings plan, people with disabilities who saved more than $2,000 could lose government benefits. Now, they can use the plan to save $14,000 a year, and keep $100,000 in the account if they are receiving SSI or SSDI benefits. Child care is available at Turnstone but you must contact Kathy Baer at (260) 483-2100 to arrange for the child care.